Still reeling from the scandal that cost him his badge, Randy Mayhill--fallen lawman, dog rescuer, Dr. Pepper enthusiast--sees a return from community exile in the form of a dead hog trapper perched on a fence. The fence belongs to the late Van Woods, Mayhill's best friend and the reason for his spectacular fall. Determined to protect Van's land and family from another scandal, Mayhill ignores the sherriff who replaced him and investigates the death of the unidentified man. His quest crosses with two others: Birdie, Van's surly, mourning daughter, who has no intention of sitting idly by and leaving her father's legacy in Mayhill's hands; and Bradley, Birdie's slow, malnourished but loyal friend, whose desperation to escape a life of poverty has him working with local criminals, and possibly a murderer. A riveting debut novel about family and loyalty, old grudges and new lives, AIN'T NOBODY NOBODY is like a cross between Faulkner and "Breaking Bad," from a talented new writer with an authentic Texas voice. Born and raised in in the Piney Woods of East Texas, Heather Harper Ellett is a graduate of SMU and a therapist in private practice. She lives in Dallas with her husband and son. 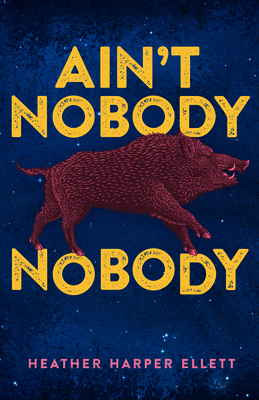 Her debut novel, AIN'T NOBODY NOBODY, will be published in Fall 2019 by Polis Books. Follow her at @heatherellett.